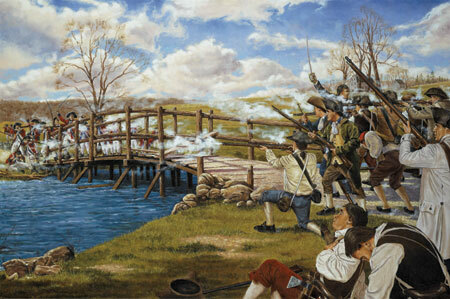 Battle at Concord Bridge, April 19, 1775; National Guard Heritage Painting by Dominick D’Andrea. 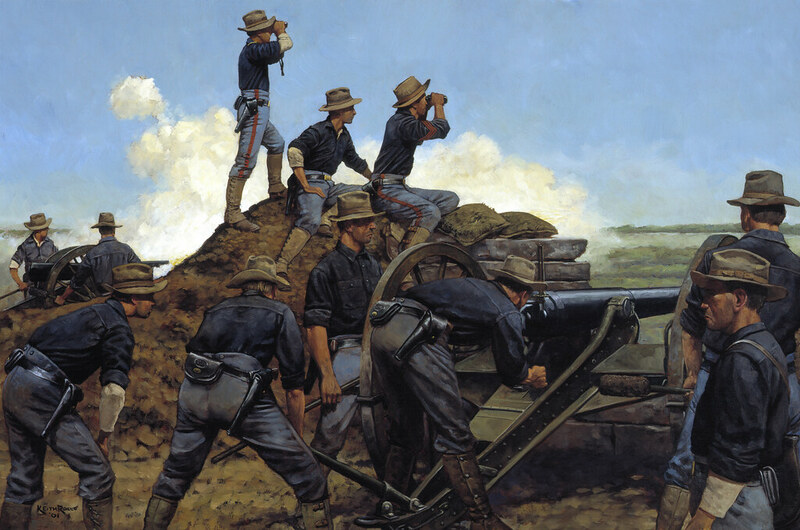 For a story of the battle, and why the National Guard considers this part of its history, check out this story by Amelia Meyer at the National Guard Educational Foundation. The phrase, “shot heard ’round the world,” was first heard on July 4, 1837, at the dedication of the Concord monument. Teachers, of course you remember to tie this battle to the Battle of Lexington, and to the “Ride of Paul Revere” by Henry Wadsworth Longfellow (though it was written in 1860, and was meant to be a call to arms for the abolition of slavery), and to Ralph Waldo Emerson’s “Concord Hymn,” written for the dedication of the monuments at Concord and Lexington. For a story of the battle, and why the National Guard considers this part of its history, check out this story by Amelia Meyer at the National Guard Educational Foundation. Before we move past remembrances of D-Day, let’s take a moment to think about and memorialize the soldiers who fought there, so many of whom died there. From the National Guard's feature, This Day in National Guard History: "Circular written by General Dwight D. Eisenhower explaining the importance of the Normandy invasion on winning the war. These were distributed to every member of the attacking force the night prior to the D-Day landings. Sergeant J. Robert "Bob" Slaughter, a Guard member of Virginia's Company D, 116th Infantry, passed his copy around among the members of Company D to get their signatures (front and back) as they waited to load aboard the landing craft that would take them to Omaha Beach. By nightfall of June 6, about half of these men were dead or wounded. Courtesy John R. Slaughter"
Normandy, France — The Allied invasion of France, commonly known as “D-Day” begins as Guardsmen from the 29th Infantry Division (DC, MD, VA) storm onto what will forever after be known as “bloody Omaha” Beach. The lead element, Virginia’s 116th Infantry, suffers nearly 80% casualties but gains the foothold needed for the invasion to succeed. The 116’s artillery support, the 111th Field Artillery Battalion, also from Virginia, loses all 12 of its guns in high surf trying to get on the beach. Its men take up arms from the dead and fight as infantrymen. Engineer support came from the District of Columbia’s 121st Engineer Battalion. Despite high loses too, its men succeed in blowing holes in several obstacles clearing paths for the men to get inland off the beach. In the early afternoon, Maryland’s 115th Infantry lands behind the 116th and moves through its shattered remnants to start the movement in off the beach. Supporting the invasion was the largest air fleet known to history. 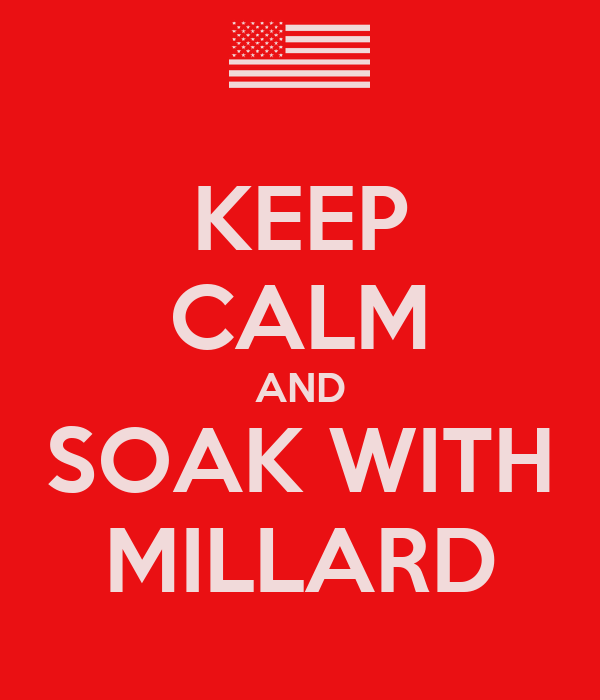 Among the units flying missions were the Guards’ 107th (MI) and 109th (MN) Tactical Reconnaissance Squadrons The Normandy campaign lasted until the end of July with four Guard infantry divisions; the 28th (PA), 29th, 30th (NC, SC, TN) and the 35th (KS, MO, NE) taking part along with dozens of non-divisional units all earning the “Normandy” streamer.